Enjoy a stress and mess free pool season! Make sure your pool toys, inflatables, noodles, deck chairs etc have a proper water resistant home by the pool so they don’t make your water sanctuary look like a mess. 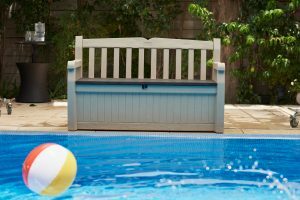 Choose the pool storage option that suits your space best. Prefer to be able to sit by and watch the action? The Eden Bench is a seat AND a storage box giving you 265L of weatherproof storage. Need more than a box? 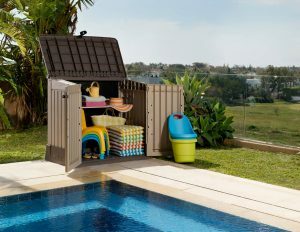 The Store-It-Out Midi is an ideal mini shed for beside the pool. Lid and front doors open for easy access to your gear. 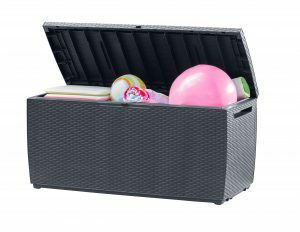 Enjoy your pool season stress and mess-free with the right pool storage! :) We deliver to all of Australia free (excluding remote postcodes).